Project Recapture is on. Public Enterprise Minister Pravin Gordhan on Tuesday acknowledged that his department, and many of the State-owned Entities (SoEs) it oversees, had been at the centre of State Capture, but then used his budget vote speech to set out how those days of complicity are over. Entities are being “recaptured” for good governance, accountability to the South African public and financial sustainability for a contribution to job creation and economic growth. Some 50-odd days into the job, and Public Enterprises Minister Pravin Gordhan has rolled up his sleeves. Whether he gets the recommended eight hours of sleep a night is doubtful. Much of the sweep-up is supported by the new boards he was able to put in place at Transnet, following last week’s resignation of three board directors there, and arms manufacturer Denel. The Eskom board preceded his appointment to public enterprises, but shares the same recapture mindset. With new boards in place, there has been a revolving door of executive resignations, usually for personal reasons and with immediate effect. In late January it was Eskom chief financial officer Anoj Singh, who was in charge during the controversial prepayment for coal to facilitate the Gupta-linked Tegeta to purchase Optimum mine although he told the parliamentary State Capture he didn’t know and couldn’t say. This week it was Zwelakhe Ntshepe, the chief executive at Denel, which was embroiled in State Capture through its Denel Asia joint venture with a Gupta-linked company, VR Laser Asia, and repeatedly defended the deal when called to account in Parliament. 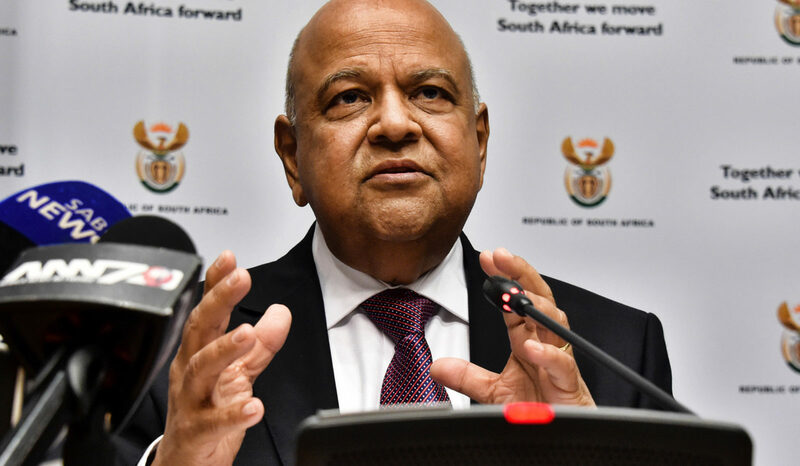 In his budget vote speech, Gordhan paid tribute to those who agreed to do their “patriotic duty” on these newly constituted boards, adding there would be more to come. With boards on the same page as the minister with regards to integrity and accountability in governance – at Eskom 42 cases of corruption have been confirmed and action is under way, as are independent disciplinary hearings against two top managers – Gordhan also announced forensic audits into contacts and governance, including at state diamond miner Alexkor over lack of information on diamond sales. “In the next year, a central focus will be on recapturing the state-owned companies,” said Gordhan. It’s already begun in earnest – and it wasn’t only about the Guptas and their associates, but also other interests. And monies spent on dodgy State Capture deals by SoEs would also be recovered as part of this recapture process, said Gordhan. It seems Transnet’s multibillion-rand deal for 1,064 locomotives, involving a Gupta-linked company, which ballooned to R50-billion with kickbacks, is set to come under scrutiny, in line with recommendations made in a previous forensic probe. The emphasis was squarely on good governance, “extraordinary accountability to the public and institutions like Parliament” – SoEs belong to citizens, not individuals, he said – and sorting out the financial mess to ensure “the word bailout starts disappearing”. Public Enterprises is in the process of compiling documents for submission to the State Capture commission of inquiry headed by Deputy Chief Justice Raymond Zondo, to be “helpful” to the commission to do its job expeditiously. “Everyone involved in any way in malfeasance will have their day at the Zondo commission,” said Gordhan. But it’s not straightforward, even in this much proclaimed new dawn of the Ramaphosa administration. There may well be “formidable progress in stabilising governance, dealing with officials part of the State Capture project” at Eskom, but as last week’s ministerial site visit to the Hendrina coal power station showed, there are challenges. Although the public purse contributed R600-million in a coal supply prepayment so the Gupta-linked Tegeta could purchase Optimum mine – now under business rescue – the coal conveyor belts meant to bring coal to Hendrina from that coal mine are not working. Instead, trucks are arriving to take the coal out. There are other problems as State Capture had created “a culture that says if the top can steal I can steal too” – and SoE employees have set up their own businesses to do businesses with SoEs. That situation could be “as bad as eight out of 10 where 10 is a disaster”, according to Gordhan. But the “toxic environment” reaches outside SoEs across South African business, where private sector companies like KPMG are finding themselves in trouble, largely related to their roles in State Capture. The good news? Not all is rotten. And much of State Capture has been revealed by honest employees. Gordhan made the call on those to continue blowing the whistle, loud and hard, because that “will help us as a community of concerned people in government, business and society to fight against corruption”. “Thank you to these honest people,” said Gordhan. As the guardian of the state’s property portfolio – it includes 29,000 land parcels, 93,000 buildings and thousands of private sector leases – public works, like SoEs, holds a transformative and money generating potential. It’s been a tricky portfolio, and the Nkandla debacle has not helped. Now there is determination to enforce a directive from the Mbeki presidency for departments to occupy government-owned buildings in Pretoria, rather than taking private leases somewhere else. This could save pennies for the state coffers. And within the next six months a national property marketing and investment conference aims to co-ordinate the letting and disposal of underutilised properties with an estimated value of R7.4-billion. Again, cleaning up and generating monies for the cash-strapped national coffers. Nxesi, having returned to the portfolio after a brief detour in sports, picked up where he left off – checking leases, finding properties that were irregularly transferred and cracking down on fraud, like acting on 16,000 suspicious payments totalling R2-billion. But also in his in-tray is dealing with fellow government departments’ perception that public works is delivering a shoddy service. The aim is to include other departments right from the start in maintenance, building or other plans, in an effort to make the most of state resources, rather than spending money in the private sector. That the need to clean up is urgent, and decisive, in many departments also became clear in the mineral resources budget vote delivered by former mine worker trade unionist turned ANC official and now minister, Gwede Mantashe. Much of the focus has been on the toing and froing over the Mining Charter, and mining companies’ insistence that once empowered meant always empowered even if their black economic empowerment partners sold their stakes. But on Tuesday Mantashe also lifted the lid on the granting of prospecting and mining rights mired in disarray with State Capture overtones. Preliminary investigations found a backlog for new mineral rights applications dating back to 2012 in some offices, while applications for the renewal of prospecting rights applications date back to 2010. Unless applications are processed, mining and prospecting stalls. “No satisfactory reasons were advanced as to why we have these backlogs. The word in the corridors is that applications from ‘known’ or ‘paying’ applicants are priorities,” said Mantashe.